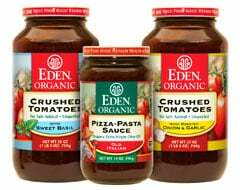 Clinton, Michigan - Eden Foods announces protective amber glass 14 and 25 ounce jars of organic crushed tomatoes and sauces in their line of shelf stable organic tomatoes. They are the only tomatoes in the U.S.A. packed in amber glass, protecting flavor and nutrients from light damage. Eden Organic Spaghetti Sauce, No Salt Spaghetti Sauce, Pizza Pasta Sauce, Crushed Tomatoes, Crushed Tomatoes with Sweet Basil, and Crushed Tomatoes with Roasted Onion & Garlic are now available in these new, protective amber glass containers. The driving force at Eden Foods for these amber glass jars of tomatoes was the avoidance of bisphenol-A (BPA) in high acid food cans, and failure of the can manufacturers to make BPA free cans for tomatoes. Light causes discoloration and off-flavor through chemical change in food. Photo-oxidation (light damage) is systemic in food stores where fluorescent lighting, in particular, reduces food quality. Amber glass is difficult to get and more costly, but it best protects food. Amber glass is also free of the endocrine disrupter chemical bisphenol-A (BPA). Eden organic crushed tomatoes and sauces are made exclusively from fresh, red ripe, unpeeled Midwestern organic Roma tomatoes, aka Italian plum, with 100 percent organic herbs and organic spices, some with no salt added. Most sauces are made from tomato concentrates. Eden tomatoes travel only 45 miles to be washed, hand sorted, cooked, and jarred within hours of harvest for maximum flavor, aroma, and nutrients. They are made without using processing aids or additives. All ingredients are declared. Romas are prized for their deep color, rich mild sweet flavor, and low acidity. They also have fewer seeds, making them most ideal for canning and creating appealing sauces. Romas are the highest in antioxidant lycopene, and organic Romas are higher yet. Eden organic crushed tomatoes and sauces contain up to 14.4 milligrams of the highly acclaimed, protective antioxidant lycopene per serving, and are kosher. Eden brand is the wise choice for greatest value and satisfaction. "Wisdom is love in discerning." Eden Foods is a 43 year principled manufacturer of natural food offering more than 250 authentic, organic, traditional, , Pure foods. All are superb pantry fare. Information and over 1000 free recipes are at www.edenfoods.com. Retailers, institutions, and co-ops, please visit us at access.edenfoods.com.